Blessed Jeremiah was born John Kostist, the eldest son of Margarite Barbato and Stoika Kostist. He was born in Romania on June 29, 1556. He learned charity at home. He and his grandfather used to cut wood for distribution to the poor. His father, a farmer, raised grain and all surplus was set aside and John's mother would use it to bake bread which was given to those who lacked food. After his eighteenth birthday, he left his homeland and went to Italy where he remained until his death. He entered the Capuchin Order in the Province of Naples and after his religious profession ministered as infirmarian at St. Ephrem's for 40 continuous years. 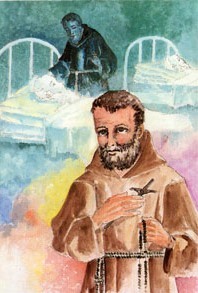 He dedicated most of his life to a generous service to the sick, in a spirit of joy and peace. Jeremiah died March 5, 1625, at the age of 69. He was beatified by Pope John Paul II on October 30, 1983. Merciful God, you gave the blessed Jeremiah the grace of imitating your Son in serving his brothers and giving himself unconditionally in service for them. Help us to follow the evangelical way of humility and love, so that we may cooperate more fully in your universal plan of salvation. We ask this through our Lord Jesus Christ, your Son, who lives and reigns with you and the Holy Spirit, one God, forever and ever.